Last week, I posted about a volunteer trek to several area cemeteries for FindaGrave.com. A friend of mine and I took volunteer photos of graves for family members of the deceased who live too far away to visit them themselves. This week is my first chance to write about the flip-side — I just received notification that someone has taken a photo that I requested. My third great-grandmother was Susan Elizabeth (SMITH) CAMPBELL. She was born and died in San Antonio, Texas (in fact, her father apparently* was John William Smith**, the first mayor of San Antonio and a survivor of the Alamo). I have never been to San Antonio, but I hope to go someday soon. While there, I plan to try and visit the graves of several ancestors, including that of Susan. Meanwhile, I posted a request on FindaGrave.com so that I could see the grave from afar. Another FindaGrave user accommodated my request this weekend. The results are bittersweet. 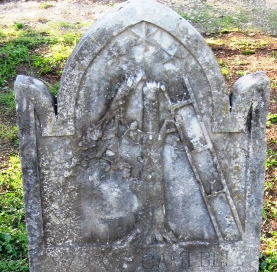 Susan’s gravestone is heavily damaged. At least half of it is just gone. It appears to have been broken, perhaps on purpose (vandalism in cemeteries is not uncommon) or perhaps courtesy of Mother Nature (trees fall on graves all the time). The rest of the stone is very dirty and worn. I can’t make out any details on the stone except two small flowers at the base on either side. I appreciate the photographer having taken the time to snap the photo, but I can’t help but be disappointed that the stone doesn’t reveal more. * I still haven’t definitively proved this to my satisfaction, but all accounts thus far seem to point to this being the case. ** John William apparently was born William John Smith, but flipped his first and last names along the way because it was easier for Spanish speakers to pronounce John. I hate to cite Wikipedia on a fact like that without verifying it, but that detail is just too fun not to mention.